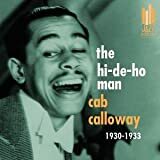 Although he describes himself as a loner in his autobiography, Of Minnie the Moocher & Me, bandleader/singer Cab Calloway was an exuberant entertainer who loved making audiences happy and enjoyed life. Born Cabell Calloway III on Christmas day in 1907, he spent his early childhood in Rochester but grew up in Baltimore where his mother was a schoolteacher and his father, a lawyer. To his parent’s dismay he hustled on the streets and spent more time at the racetrack than in school. He took voice lessons at 14, learned to play the drums, and joined Johnny Jones and His Arabian Tent Orchestra at the age of 17. His older sister Blanche was in show business, and Cab joined her in the touring cast of the black revue Plantation Days when he was 20. When the show closed he entered Crane College where he played basketball. But he continued singing, landing the emcee’s job at the Sunset Cafe, a prominent Chicago nightclub, and leading the band, the Alabamians. While popular in the Midwest, the Alabamians were old-fashioned when they opened and closed on the same night in 1929 at New York City’s Savoy Ballroom. The band toured relentlessly, and Calloway was one of the first bandleaders to have both baseball and basketball teams that played semi-pros in the towns where they performed. The band members at various times included Chu Berry, Milt Hinton, Benny Payne, and Dizzy Gillespie. They toured the U.S, Europe, South America, and the Caribbean and appeared in films. Calloway himself had a leading role in 1943’s Stormy Weather and featured roles in later films and shorts. Rough times hit the big band business in 1947, and Calloway reduced the band to a combo. He played Sportin’ Life in the 1950 Broadway revival of Porgy and Bess and continued performing into his ‘80s, playing Horace Vandergelder in Hello Dolly! providing half-time entertainment for the Harlem Globetrotters, playing the Catskill Mountain resorts, and performing with his daughter Lael. He was active until his death at 86 from a stroke.